I’m unable to get the home page panes to display on my website at litquake.org/sandbox/2012. Following the steps in Prasanna’s blog (http://www.prasannasp.net/how-to-enable-homepage-panes-in-graphene-theme/), I created “Welcome” and “Blog” pages and used them to set up a static front page (under Settings-Reading). 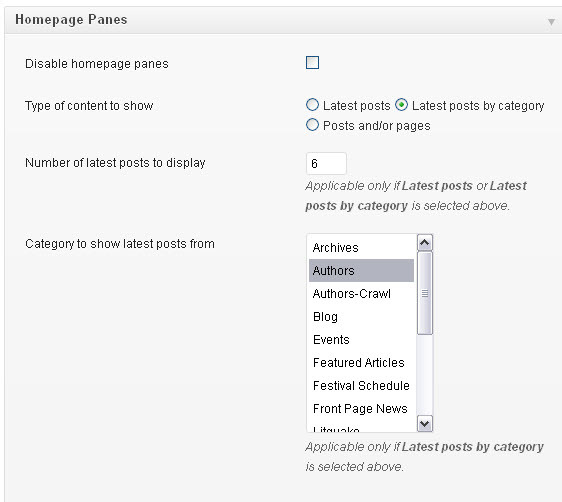 In Graphene Options-Homepage Panes, I have the “disable” box unchecked, and set up to show “Latest posts by category” and 6 posts. Can you attach a screen shot of your Homepage Panes settings in Graphene Options? Don’t tag images from Gmail! It’ll show up to you only when you’re logged in. Other’s won’t see the image here. So, upload the screenshot to http://imgur.com and paste the BBcode here. Hmm.. Is there atleast six posts under Authors category? Try with 2 latest posts and tell me the result. The Authors category has more than 1000 posts. But I changed the settings to display 2 posts instead of 6. Still no panes displayed on home page. Still no joy. I deactivated all plugins, cleared browser/server cache, and even tried with a different browser (one I seldom use). No changes. That’s strange! Would you mind giving me temporary access to your WP-Admin area? I’ll take a look at the issue from the back end of WordPress.